Hello Loves! Did you miss me? I know, I know...I've been gone for a week. I'm still swamped getting ready for my new job, but I decided to take a little break today to show you some of the new Gel Play colors from Akzentz for fall. I confess, this post is a little rushed and I didn't do as much editing or take as many pictures as I usually would, but I'm sure you understand. Anyway, Akzentz sent me three of the new colors to show you, and they are fabulous! Let's take a look at the swatches. 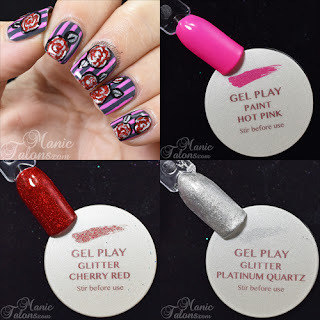 I didn't swatch these on my hand due to the time factor, but I think you can get a good idea of the colors from these pics. First up is Hot Pink. 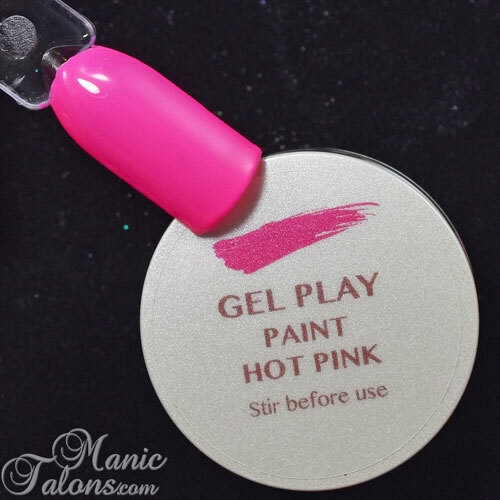 Hot Pink is a bright pink cream. I usually think of "hot pink" as having more red to it, but this one is definitely bright. Next up is a fabulous color for the Christmas holiday! 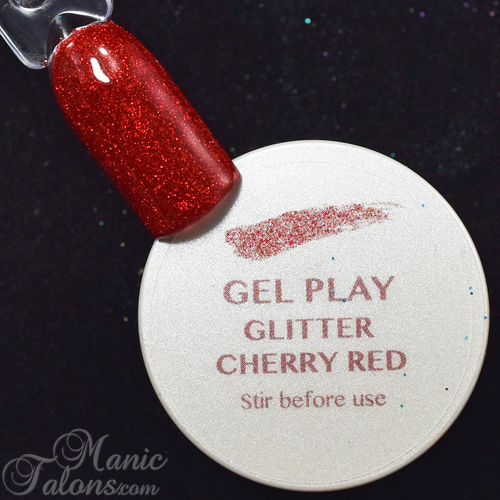 Cherry Red is a beautiful glittery red. 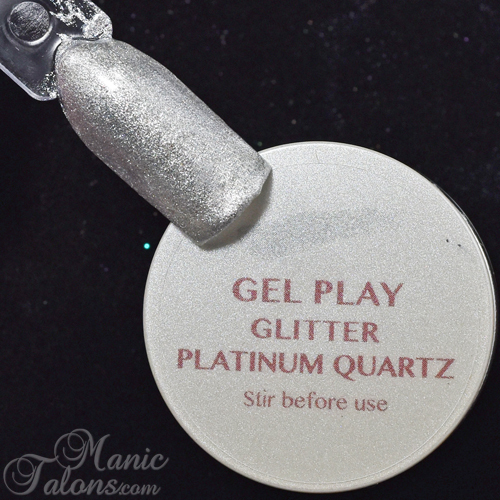 The glitters in this one are super fine with beautiful sparkle. They are also what I would consider a true red - not too orange and not too blue. This picture is a little dark, but you'll see what I mean in the crazy nail art combo in a minute. Finally, Platinum Quartz is the color that excites me the most. This is what I consider to be a true, bright silver. Actually, she is what I wanted Cosmic Silver to be. Almost white, but still very much a silver shade. Pure, even. The glittery particles are super fine, making it very easy to get full coverage color. Excuse the lack of "smooth" in my swatch. I already packed my good gel brushes to take them to the salon, so I was working with a crappy brush. 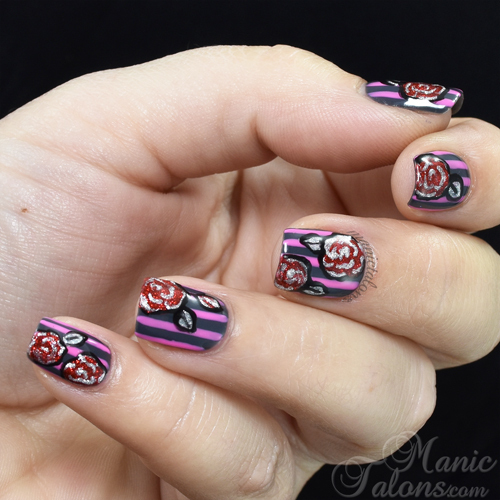 Now that you've seen the colors, how about a little nail art using all three of them? Yeah, I know...it was a bit foolish to try and pair a bright pink cream with red and platinum glitter, but I've never claimed to be the sharpest tool in the shed. lol I actually hated this one at first and vowed to try again, but it slowly grew on me. I ended up wearing it for over a week and took the photos 4 days in, so excuse the growth. 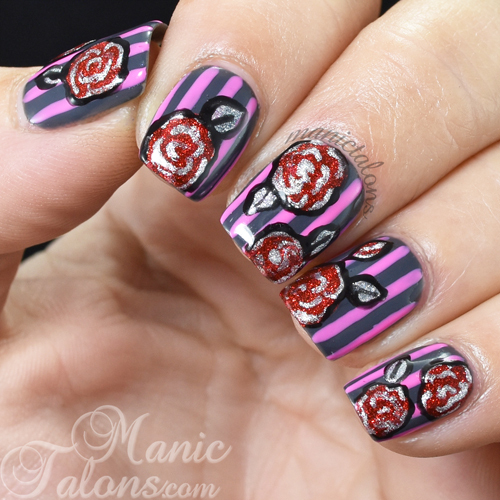 I started with a grey base and added stripes of Hot Pink. As you can see here, hot pink looks much brighter and lighter over the grey base. This IS color accurate. 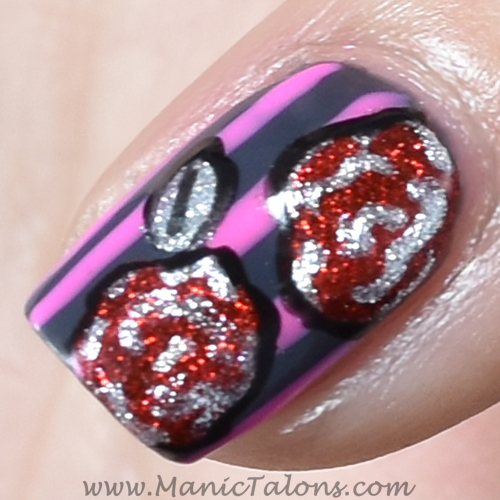 I then added roses with Cherry Red and Platinum Quartz and outlined them with Gel Play Black for a cartoonish effect. Here's a close up that shows the sparkle of Cherry Red and Platinum Quartz a little better. Of course, it freaked out my camera a little so the glitters are slightly blurry. Sorry about that! So there you have them - three of the new Gel Play colors for Fall! If you want to add these to your collection, you can locate them in your area through the distributor locator on the Akzentz website. These are Pro products, so they may be a little difficult for DIYers to find. Sorry about that! *The Gel Play colors featured in this post were provided by Akzentz for my honest review. All links within this post are courtesy links and do not benefit ManicTalons.com.